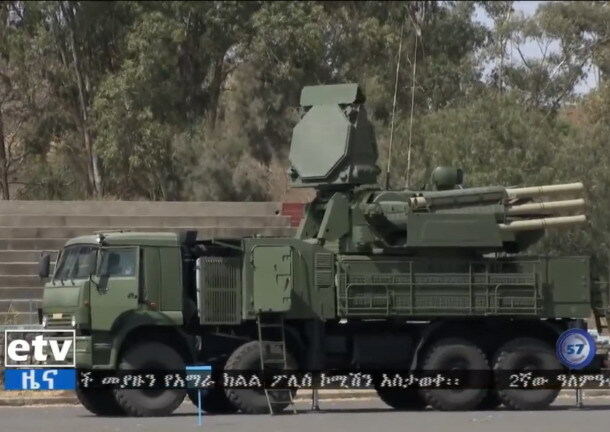 Ethiopia is now operating the Russian Pantsir-S1 air defence system, with television footage showing the gun/missile defence system in Ethiopian National Defence Force service. Footage shown on Ethiopian television this month showed at least one system in service, alongside an S-125 (SA-3) launcher. It is not clear when the Pantsir-S1 system was delivered or how many have been received. The system (SA-22 ‘Greyhound’) was designed by the KBP Instrument Design Bureau of Tula, Russia, and is manufactured by the Ulyanovsk Mechanical Plant in Ulyanovsk. It combines two 2A38M 30 mm automatic anti-aircraft guns developed from the two-barrelled 30mm GSh-30 gun, with twelve 57E6 surface-to-air missiles. The Pantsir-S1 is mounted on an 8×8 vehicle and can fire at two targets simultaneously and attack 12 targets a minute. Effective range is 20 kilometres. It can engage artillery shells out to four kilometres. The fire control system includes a target acquisition radar and dual waveband tracking radar with a detection range of 32–36 km and tracking range of 24–28 km for a mid-size target. The fire control system also includes an electro-optic channel with long-wave thermal imager and infrared direction finder. In Africa, Equatorial Guinea is also known to have ordered the Pantsir-S1 system and received two around 2017. Ethiopia has upgraded its air defences in recent years and in 2016 fitted its S-75 (SA-2) long range surface-to-air missiles to T-55 main battle tank chassis to create mobile launchers. The launchers are believed to have been developed by Ethiopian Gafat Armament Industry (a subsidiary of the military-run Metals and Engineering Corporation, METEC).